Being a parent's caregiver comes with a range of responsibilities. 2. What Deductions Can I Use When Supporting a Grandchild? 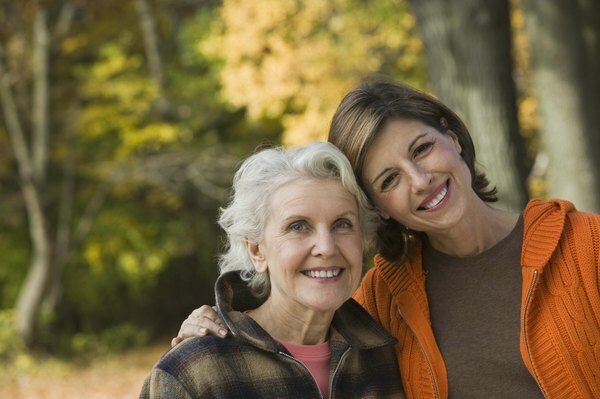 Taking care of your elderly parents can be a time-consuming and expensive task regardless of your desire to do it. If you find yourself in the situation of financially supporting your elderly parents, there's the chance you may qualify for some tax breaks to help lighten your load. The federal government offers tax deductions and credits to refund caregivers some of their added expenses. If you care for your elderly parents, you may be able to claim them as dependents on your federal income tax return. If you pass several IRS tests to make sure your parents qualify as dependents, you can take two additional exemptions for the tax year. Parents automatically pass the relationship test. In addition, your parents’ total gross taxable income for the year can’t be more than the income limit for that tax year -- $3,700 for 2013. You must also prove that you paid for more than half their expenses during the year. This applies even if your parents didn’t live in your home with you. If you paid another person to take care of your parents while you worked or looked for work, you may be eligible to claim the child and dependent care credit. You, and your spouse if you file a joint return, must earn income during the year for you to be able to take the credit. You must also be able to claim your parents who are physically or mentally unable to care for themselves as dependents. If you qualify to take the credit, you can claim up to 35 percent of the expenses you paid toward one parent’s care up to a maximum of $3,000 in expenses. The limit is $6,000 if you paid dependent care expenses for both parents. Even if you can’t claim your parents as dependents, you may be able to deduct the medical expenses you paid for them. If your parents’ income is the only reason you can’t claim them as dependents, the IRS allows you to use the costs you pay for their medical care when itemizing your deductions. Allowable medical expenses include prescription drugs, dental care, hospital stays, long-term care services and premiums you pay for your parents' supplemental Medicare coverage. You can deduct only the amount that exceeds 7.5 percent of your adjusted gross income for 2012 or 10 percent for 2013. If you and one or more of your siblings share in paying your parents’ expenses, you may still be able to claim them as dependents as long as you can show that you contributed to at least 10 percent of their support. Since only one of you can claim them as dependents, your siblings must agree to let you claim your parents as exemptions for the tax year. File Form 2120, Multiple Support Declaration, with your tax return indicating that while more than one person contributed toward your parents’ financial support, the others are waiving their right to claim your parents as a tax exemption. You can do the same and waive your rights to let one of the others claim your parents as tax exemptions. Do I Have to Itemize for a Childcare Deduction?